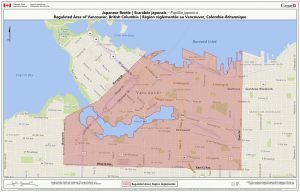 As of April 27, 2018, the Canadian Food Inspection Agency (CFIA) is restricting movement of soil and plant material out of the False Creek area due to the identification of an invasive plant pest, Japanese beetle (Popillia japonica). For the designated area (as shown), there are year-round restrictions for the movement of soil and rooted plants, and seasonal restrictions for the movement of above-ground plant parts. The restricted season for above ground plants is during the adult beetle flying season, from June 15 to October 15. In a coordinated effort, the City of Vancouver has set up a temporary transfer station within the area for green waste and plants mixed with soil. Residents of the area can also continue to use their green bins. Those wishing to transport soil out of the regulated area will require a CFIA issued movement certificate. The purpose of the movement certificate is to ensure the top 30 cm of undisturbed soil at a property undergoes a CFIA-approved treatment method, such as deep burial. Soil from deeper than 30 cm will not require any additional risk mitigation measures, but a movement certificate is still required. To obtain a movement certificate, email cfia.wstJB-SJ.acia@nullcanada.ca to request an application. Note that a movement certificate can take up to a week to issue following application submission, and a copy of the movement certificate must accompany each vehicle/individual moving the soil. Find additional information for construction companies HERE.